1. Touch your horse everywhere. 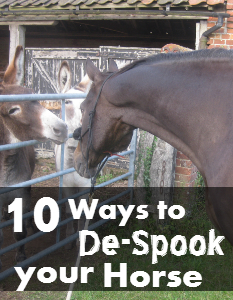 This might seem a bit strange when we’re trying to prevent spooks when ridden, but I bet if your horse is spooky under saddle he also shies on the ground when being led around. Desensitizing a spooky horse should really start with your horse accepting you in his space, and I mean everywhere! You need to be able to touch your horse from the tips of his ears to his sheath/her teats, between his legs and all four feet – without the horse pulling away. Once you can do this you can progress to rubbing a cloth all over your horse, then something noisy and strange like bubble-wrap and then something really crackly, such as a plastic bag. If your horse won’t accept your hand or you don’t feel safe because of his reactions, try using a sponge tied on the end of a stick at first, then make the stick shorter until your horse will accept your hand. It’s really important to be fully aware of your horse’s body language all the time. Do you get bitten, kicked or trodden on a lot? You probably aren’t reading your horse very well. Don’t listen to music when you’re grooming, leading or riding out, focus on your horse and the subtle signals he’s giving you. This way you can often preempt your horse’s reactions to its environment and prevent accidents and injuries to yourself and potentially your horse. Research has shown that horses which are regularly trained in-hand are better behaved under saddle. Timing and communication are key here. The more your horse understands your aids then the more responsive he will be e.g. to stand still without fidgeting or to go where you ask him to go. You need to praise your horse every time when he does something right. Your horse needs to understand “YES” to prevent confusion. Praise can be very motivating and horses will often try to repeat their actions if they are rewarded positively. Positive reinforcement simply means giving the horse something that will make the action performed more likely to be repeated. For horses this might be scratching at the wither or food rewards. Scratching at the wither is preferable to patting as patting is unnatural for the horse whereas scratching at the wither is part of mutual grooming behavior. Research has shown that scratching at the wither can lower the horse’s heart rate and therefore could be useful to calm a nervous horse. Food rewards need to be delivered carefully and with correct timing. Clicker training can pinpoint the precise moment the desired action was performed correctly and is worth pursuing if you want to communicate clearly with your horse. To me light aids aren’t just about responsiveness, they’re also about the horse’s confidence and willingness. Horses that are hard mouthed and dull sided have learnt to switch off and not listen to the rider due to being given conflicting aids. For example, a kick to move forward, followed by the rider loosing balance and pulling on the reins. Or, using the reins to create a neck posture, maintaining the contact (which means stop) and pushing the horse forward into the contact without releasing. A horse that can walk, trot and canter on a loose rein whilst maintaining balance and rhythm is a confident horse. Your horse needs to take control of his own feet and be independent. This is especially important at the walk. On rough terrain let the horse put its head down so it can see where it is going. A horse that is able to look at its environment and figure out for itself that it is safe is less likely to shy or be spooky. This doesn’t mean you get to switch off though! You need to be fully aware of your environment and your horse’s responses too. If your horse does shy, spook or stop dead and refuse to move forward you need to be in a position to have the time to let the situation play out. Don’t let your horse turn away from and object that worries them. I would encourage investigation, actually going up to objects and touching them will help desensitization. Clicker training can help with this as you can reward every effort made by the horse and therefore motivate the horse. If the horse is spooking at something you don’t want them to touch, such as fire or a barking dog, allow the horse to face it and look at it. You need to be capable of preventing the horse spinning around. If you’re not able to do this you could ride out with calm horse, or have a long lead rope to hand and get off and lead the horse (which many horses would find more comforting, especially if you put yourself between the horse and the object it is scared of). Research has shown most horses make an effort to move forward past a worrying object after 13 seconds of standing and assessing it. Andrew McLean has discussed that horses learn in different ways and one of these is ‘generalization’. In other words it takes exposure to something in five different situations for the horse to accept it. For example if your horse is scared of pigs it would need to be desensitized to pigs in five different places before he would accept a new field of pigs without fear. Go find those pigs! Meet your problems head on. Scared of Velcro? Expose your horse to it daily. Scared of tractors? Find a yard where the tractor could be used close to your horse daily, for delivering hay for example. Scared of cows? Could your horse share a field with some? Be prepared to take a lot of time solving issues. Seek out opportunities for exposure. Ride to the field of cows, get off and stand there with your horse until he starts grazing, then get back on and ride home. De-spooking takes time, consistency and patience but you can do it if you really want to. Is you horse shying or spooky? My favorite, don't be an avoidaholic!! so true. I know friends that have taken their horses to learning sessions to be more prepared for things that spook them. No one wants to fall off, right!